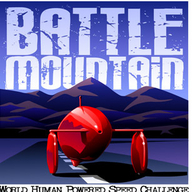 The World Human Powered Speed Challenge in Battle Mountain Nevada. Home of the Human Powered Land Speed Record. Sanctioned by the International Human Powered Vehicle Association Live meeting coverage 11am and 8pm PST daily see the event website www.whpsc.org Special thanks to Newmont Mining for their continued support of this event.